Your collection of ink pads, markers, and refill bottles will be stored together and available right at your fingertips when you organize them in one of our best-selling products. With a Combo Holder, you'll have easy ink pad removal with the finger slot in each divider, less wasted counter space, and no more mismatched color families. The Combo Holders are compatible with a wide variety of ink pad brands such as Stampin’ Up!®, Memento™, ColorBox®, Distress™, and more. You can now make space in an IKEA® Kallax shelf for the Stamp-n-Storage Combo Holders for IKEA®! Two sizes are available, the 12 and 24. 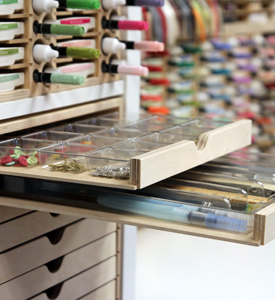 Mix and match the Marker Holders for IKEA® with the 12 Combo Holder for IKEA® in your Kallax. Check the dimensions listed below to make sure yours will fit! The dividers are removable if you want to store your larger accessories. This product has the option of being wall-mounted too! Wondering what size this product is? View images for dimensions. 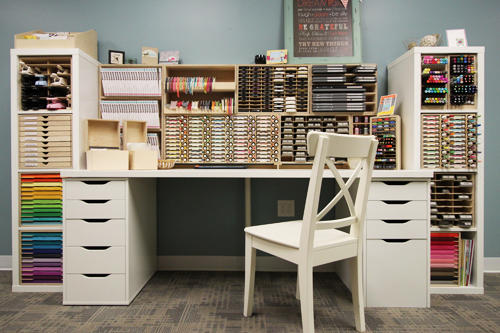 I love how it makes my craft room look organized and I like the sleek slim design. Everything is at my fingertips. Sturdy, well constructed, exactly what I wanted. The company was excellent to deal with when I had questions. I received my product in the amount of time promised. Only downside is shipping costs to Canada. I thought about this purchase for a long time before I finally said the heck with it and placed my order. I am so extremely happy with my 2 combo units. While filing them, I found I had duplicate ink pads, miss8ng markers, etc. Without this unit I really had no idea of what I truly had. I will be purchasing more items in the future as they are sturdy and very well made. THANK YOU, THANK YOU, THANK YOU!!!!!!! This is a great addition to any stampers area. It is great quality and a fair price. Love that I am able to organize my space so that I always know right were to find my things. Thank you for the speediness of delivery. I bought my first one of these a couple of years ago. I started to realize it was a nuisance to always look for retired Stampin'Up! reinkers and markers, even though I had the ink pads in a handy spot. I decided to get a second 60 space holder for all my retired pads, reinkers and markers. I just love it! Who knows... if I stick with Stampin'Up! several more years, I made need a third combo holder in my studio!! I have been wanting this for a very long time and it absolutely did not disappoint! I love that is fits everything and yet it is very compact and fits in my space very well. Love this item so much! I love this combo holder! It holds most of my inks and I am thankful for the video showing how to make the paper folds for the inks that slide in too far. I would recommend this to anyone that wants extra space. Very sturdy wood. I also like that I am dealing with Christian people so I know I am getting great service. Thank you so much! I will continue to buy. I have never gotten anything from stamp n storage that was not exactly what I needed. This is my second ink combo holder and I love them both. They are kinda expensive but so worth the money. This keeps all my stamps, markers and refill colors together and easy to find. I was in love from the moment I opened the box! How wonderful to have all my stamp pads, reinkers and markers all in one place! I originally questioned whether or not I needed the combo system but so glad I did it because now I can see which reinkers and markers I need. Again, all in one place! Thank you! Thank you! Stamp N Storage! I love having my pad, ink refills and markers all in one place. My stamp pads fit perfect. Once again, shipping was lighting fast...ordered on Saturday and receive on Friday. Once again, excellent experience with this company. The best storage there is. Buy more than you think because I will have to go back for a 3rd shipment. This combo holder couldn't be more perfect! I absolutely love it. It's so well built and sturdy. It will definitely last a long time. Nice holder works great for me! Love this unit. Nice to see my colors at a glance. More room on my counter and organized. The unit itself was made very well. Yes I'd get another one. I love, love, love this storage. I didn't realize the shelves slide out. This is marvelous for cleaning, rearranging spacers and aligning color families.I have arthritis in my hands and the small half circles in the front of the shelves and spacers are a much appreciated detail that allows me to grab an ink pad easily and without pain. Being able to find the pad, refill and marker without having to sort through all the refill tray & marker box has been a time saver. The holder makes that was scattered and disorganized look organized, and clean and so easy to use.The combo holder gives my craft room a neat appearance. The ability to easily find, use and put back essential supplies helps inspire my creativity.This is so much better than I even imagined from the pictures. Thank you! I love the combo holder. Great for keeping my ink pads, markers, and refill bottles organized. Great customer service. The combo holder is well made. 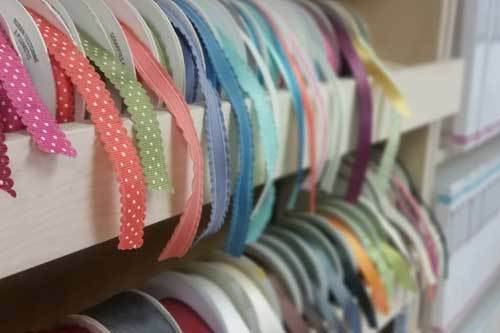 Highly recommend Stamp-n-Storage as a great place to shop for organizing your craft room. Love it!! I have both styles of SU ink pads and it works perfectly for me! Plus having refills and markers next to the ink pads is super wonderful!! You never know what you need until you see it. Great customer service and great products. I love my combo holder and have already started filling it up with my Stampin Up pads, refills, and markers. So easy now to see everything that I have. I also love the sturdiness of the magnets for storing my dies. Highly recommend these products! Love the quality of everything I have ever purchased from Stampnstorage. This unit puts all my ink pads and accessories right at my reach. I don’t even have to move from my stamping area. I have one of the larger units and needed additional space for the new Stampin Up colors. The new unit matches perfectly. It's so great to have the stamp pads, markers and refills all in the same place. I love this product. The way it’s set up everything is at your finger tips. When you are creating a project it is easy to find the color and product you need. And it lines a wall so that leaves a lot of space to work in. I just received my first storage item. I love it. It has all my SU ink pads, inks and pens together in one place and easy to reach and use. I have just ordered te Lock Down Punch Holder and can't wait to organize them. Thank you for creating these items. I have wanted one of these for years! I finally purchased one and I absolutely LOVE it! I am a Stampin' Up! demonstrator. It holds the 4 color families, the 10 In Colors and has room for my Stazon, VersaMark and Memento inks. I like to have 2 of each color ink, to make it easier at Stamp Camps, so I just ordered another 60 count Combo Holder and am excitedly awaiting its arrival. Great product! My only regret is waiting so long to buy it. I just love it...and have already completely filled it. I have Stamp N Up (pre 2018 design) and Anna Griffin Color box stamp pads. Work around for smaller pads, you can either lift up on the cut out area, or easily slide shelf out. They are very well made, and arrived with no issues. Would love exterior to to be painted in white as a purchase option. It is perfect. The best expenditure of my 20+ years in stamping. I have been able to maximize my work area efficiently, so that I don't waste time looking for things. It is everything that everyone has said it is. I love my new Ink Pad Combo Holder! Not only is it well made, but also it organizes my inks, refills, and markers where I can see them all in one place! This is my 3rd storage unit I have bought to store my stamp pads, markers and refills. I love it! I’ve been needing storage to organize my Stampin Up pads, re-inkers & markers & this is perfect! I am very happy with it. I will be hanging it on the wall since I have limited space in my room. I bought one of each of these to store my ink pads, markers and refills to keep them all within reach, but also because the look of them all laid out nice and orderly is just so eye pleasing. The units are well made, sturdy and solid. I have put the ribbon shelf on top of the 48 unit, and they stack up very nicely. I love them! Saves a huge amount of space in my craft room and cemtralizes all my ink needs. Would recommend these units. Just be aware they are made with raw wood and not painted. OMG! What a wonderful product. It is so well made and a very ingenious design to be able to store markers and re-inkers along with the stamp pads. I could never find the re-inker I needed. 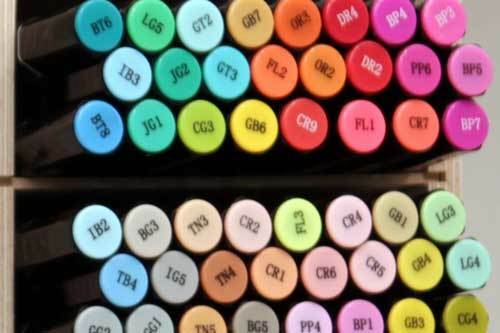 I can also see at a glance if I am missing markers or inkers that need to be re-ordered. I am so glad I purchased this product. This is a dream come true for me! To have all my inks, refills and markers together and within reach is simply amazing! I've seen this set up for years and only dreamed about having my own. Now my dream has come true and I love it! Wish I'd done it sooner! Absolutely love this product. I purchased the 48 combo and the 36 combo. I am delighted with the storage of ink pads, refills and markers all together. The products are well constructed and arrived in perfect condition. I love the way my new 'Combo Holders' not only look so wonderfully organized but also, at a glance, helps me to see which ink pad, ink refill or marker is either missing or needs to be purchased. My 'Combo Holder" is very sturdy and I'm sure will last a long time. Fabulous quality as always. Love it! Great customer service too! This is a great thing for storing the ink pads, markers, and refills together. I'm glad I got it. I just love this combo holder. It fits perfectly on my shelf. I ordered the 60 sp O have room for new color releases. It is well made yet not too heavy. Everything fits perfectly. Love my combo holder. I filled it up an now I need another one! Love it! The item arrived while I was out of town...it was painful to have to wait a whole week to unpa k it and use it, but it was worth the wait! Just seeing the colors so easily will be such a help and a boost in creativity as well. WOW.....JUST WOW!!! I love it! AND I love Stamp-N-Storage!! Super products and great customer service!! You will be so thrilled with whatever you decide to purchase! Very good quality and very efficient products! I can't get enough of them! After watching the great videos on this site I had an idea what the product would look like. The quality, color, durability, and size was exactly as expected. Definitely a quality product. I highly recommend this company to anyone who wants a great product and a great company. I love my ink pad storage combo it is AWESOME. The quality is top notch. I'm looking forward to purchasing other products from them in the future. You won't regret ordering from this company.!!!! This is the second order I have been able to get from StampnStorage. I love the combo holders, as I feel so much better when I can put my stamping supplies away in an organized way. And it's so much easier to access them, as well. This unit is fine, it does the job, but I have to confess that I liked the older model that was on a carousel a whole lot better. I really LOVE that old one. It holds more and also has storage on top of it. I wish you still made that one. I have 3 combo holds for IKEA. I really like them to keep everything together according to color. This storage allows me to see my stamp colors and easily find a matching marker or refill. They are shallow and it seems I waste storage behind them, but I can always hide things if I needed. The product is well constructed. Arrived in a few days. Could not be happier with it and now I have everything I need right at my fingertips. I am a stampin' up "hobby" demonstrator and have had their circular holder for many years. I began running out of space and needed more room on my table Ordered this combo to hold all my stampin' up inks, reinkers and write markers. What a perfect solution. I already have other Stamp-n-storage items so I knew the quality would be outstanding. And the speed of shipping is beyond real. Whatever you order from Stamp-in-Storage, you will NOT be disappointed! I finally bought this after years of wishing for one to live in my Stamping Office and it did not disappoint. I should have bought this a long time ago! SO! When I ran out of room with the big inkpad storage that I have had for a long time, I just had to get 12 more racks. Love this product. It took me a while to order the Combo Holder because the cost is more than many of your typical craft storage item. But as always, as soon as I saw the quality of the item, I knew I made the right purchase. The shipping was quick, the item was well packaged, and most of all, it is extremely well made. My Dad was a carpenter, and he would be impressed by the craftsmanship. Thank you. I got the 60 Combo Ink Holder. I LOVE LOVE LOVE IT!!! Ordered it one evening, it shipped the next day and I got it the day after. I love having the ink pads, reinkers AND markers all together. So well built too. Well worth the money spent! Just received my second 3 combo ink pad, refill and marker storage unit. I absolutely love these items. It makes finding all my inks so easy. I really love the quality of these products! I just ordered another combo holder because I was so impressed with the one I had previously received. They are perfect for organizing all my inkpads, reinkers and markers. I was super impressed with shipping. I ordered on a Monday and received the products on Tuesday. Wonderful customer service and quality. I love, LOVE, this system. Only wish I have bought the one that holds 48 ink pads, refills and markers. Will be a return customer. I love this system. It is so well made and perfect for having my colors organized and at my fingertips. Highly recommend. I love the holder for the ink pad and refills but the markers stick out to far for me. I got it because it was slim and would take up less room but with the markers sticking out it doesn't save a lot of room. If I had to buy again I would by the one without the marker holes. This is my 2nd purchase of the 60 slot holder and that is because I not only have the products to store in them, but these are quality storage items. Only negative is that I would rather not have them in raw wood. I have to varnish them myself to protect them and they look so much nicer as well. Absolutely love this organizer! I smile every time I use it. It makes stamping that much more enjoyable. I love my combo holder! The craftsmanship is terrific. It's solid and well made, no splintering. I recently moved my stamp room in my house and due to having a more compact space was unable to see all my colors at the same time. Having the pads, refills, and markers at my fingertips is awesome! I love being able to unleash my creativity more easily. Highly recommended. I absolutely love my # 60 ct. combo ink pad holder. ( Holds the Ink Pads, Markers and Refill Bottles) and I can't wait to add to this. I love its clean compact look. (There is no waste of space its a perfect fit.) I now have more space on my work surface. And the convenience of having everything at my finger tips. And In my opinion a fair price....I'm a very Happy Crafter. Thank you stamp n storage its exactly what I was looking for . I love the Combo Holder! Love that all my ink pads, re-inkers, and markers are together by color in one place and easily accessible. The markers stick out a little farther than I'd like them to but it isn't a problem. Absolutely gorgeous. I love this unit. Will definitely be ordering more items.. I love the combo holder I recently purchased. It holds markers, stamp pads and inkers together, thus making it easier to find what I need. I had only seen pictures of the combo holder and was very pleasantly surprised when I opened the box!! Great workmanship and I didn't have to put it together! I am hooked and will be ordering more! I am very happy with my combo holder. No set up required. Well built ! I had my stamp pads, markers & ink all organized quickly. I would recommend to anyone. Well worth the money spent. This is the most amazing purchase I have ever made. So nice to have all my ink, marker, and reinkers together. Was able to open up space for my craft room which is very busy. I am in LOVE with the Combo Ink Holder. I primarily use SU product and this is perfect on my L shaped craft desk. It is just wide enough for the stamp pads & thus doesn't take up a lot of room along the wall. It's handy, easy access makes grabbing the right color easy! I also love that I don't have to search for the coordinating markers! They are right there! Just LOVE it! I love my combo holder - my inks, markers and reinkers are now all in one place and easily accessible. Also, thank you for your Christian witness. May God continue to bless you. I love how this piece holds all the markers and reinkers next to the pads. And it takes up less space than my old spin racks. I love this holder as it fits my IKEA shelving unit. I wish that SNS would have one that did not include the refill bottle though. I don't have but a few refill bottles so I feel I have wasted some money but I want my pens to be next to the pad it goes with. This combo holder is fantastic. It is helping me get more efficient at my craft by providing a wonderful storage for my ink pads, pens and bottles. This item looks great and it really keeps my area neat. I love it. I just received the large Combo Holder this week. It is very well made and all my stamp'in up ink pads and reinkers and pens all fit in the holder. Love this piece as it keeps ink, refill & marker all 3 lined up together and so accessible. Would have preferred a nice glaze or finish on the wood rather than raw wood so i don't have to apply a finish myself, but it's still going to be a great piece once i get the finish / varnish on it. Replaced my metal turn around stamp pad and refill holder with this unit. Fits perfectly on my craft desk next to my lock down punch holder. Now I have all my supplies for card making at my finger tips! Love all the Stamp and Storage high quality products. I love the ink, marker and refill storage......I now need to get a second one. Can't wait to order more storage options. This is the best way to store all of your stamp pads, refills and markers in one spot. 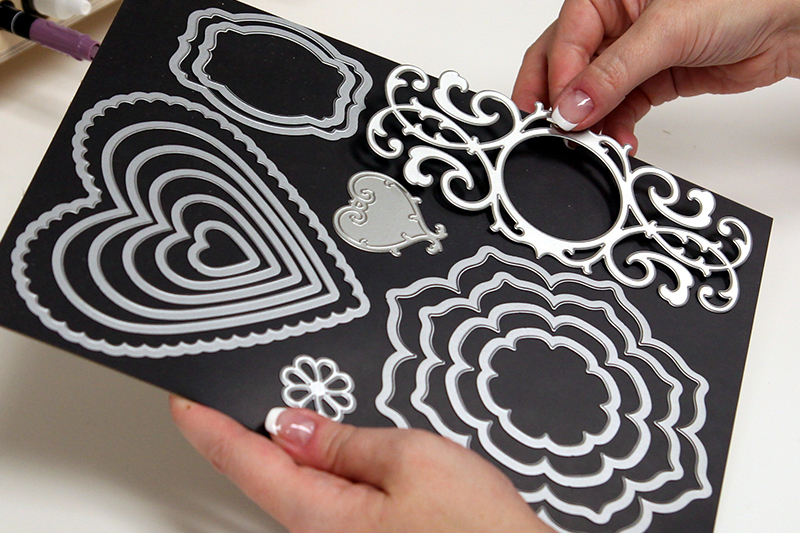 Easy to get to and makes stamping more fun and you can stay organized! I just love my Pad/Refill/Marker Combo storage pieces. I started with the 60-ct unit and just received my 36-ct unit and already have it merged into my storage area for my SU ink pads. Excellent quality! It is great to be able to have everything together. These are sturdy too. I pondered about this purchase for about a year. I kick myself for not buying it sooner. It is amazing and perfect for all my products. I filled it up immediately and am beyond excited about it. I now have two of these Combo Holders for the Ikea Kallex. The workmanship is excellent and it is wonderful to have a happy, visual pleasing, permanent home for my ink pads and pens. I will be getting refill inks in the future but my stickles have a temp home now. I work better in an environment that is not cluttered. I received the 60 ink pad combo holder on time and I love it. It fits very well on my desk and is so handy to use. I am in awe of this company and their products. I bought one (60) of these and set it up...lt was so great I immediately ordered a second one. They are very well constructed and attractive to look at! It is so nice to have my stamp pads, markers and ink refills organized and easy to find instead of spread out and hiding here and there. Time to start stamping! This is a carefully thought our storage system, and very well made. 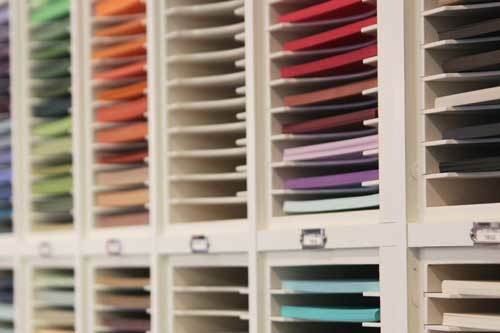 I can store all 4 color families of Stampin Up! Ink, markers and re-inkers. In addition, it holds 2 years of In Color Inks as well. I can now easily find the items I am looking for. I want the paper holders next! The combo holder could not be more perfect. This is my second one and they fit perfectly atop each other. I lost a stamping block down inside of the holder and was so excited that I could slide the shelves out to retrieve it. So Thoughtfully made with stamper she in mind. I love it!!! Just finished putting all my SU pads, markers, and refills in the Combo Holder. 100% better than using the caddy. I love having the convenience of having my stamp pads, refills and markers all together. This is it! The BEST ink pad, marker and refill holder. Before I got this, I kept all of my ink pads, markers and refills in different places. It took up a lot of room. Now I have them all neatly stored together and it's easy to find whatever I need. If you're looking for optimum storage and organization, this is the item for you. I will order another because I shamefully admit I have more than 60! Thanks for all your wonderful storage solutions! The Combo Holder just makes my crafting so simple with all the stamp pads, reinkers & makers all in one place. I was so excited to get my combo unit for my stamp pads, reinkers and markers. I am beyond thrilled. The quality is fabulous, and it is so wonderful to have all of these products at my fingertips. New city, new house, new craft room. The first room I put together was my craft space. Perfect for my significantly smaller space. Love it! Love the combo! Keeps your ink and pen within reach at all times. I already have the 60 and came back for room to grow. Excellent quality and craftsmanship. I just unpacked the combo holder for my wife. It seems to be really well made and will be a welcome addition to her workroom. I just got my second combo holder and I can't imagine organization in my craft room without it. It is well constructed and sturdy, and it holds everything I need and it's right at my fingertips. Great product! I purchased both the combo holder and lock down punch holder. I am very pleased with the design and craftsmanship of the item but even more than the punch holder , I wish it was finished wood with paint or varnish that I could wipe off ink leaks from my ink pad. I received the item right away! Your customer service employee named "Cindy" is a real gem! She was great to work with on the phone. OMG! Combo holder is PERFECT for Stampin' Up! inks! I absolutely LOVE my Combo holder for inks, refills & markers! I had a spinner rack for inks but hated always hunting for refills. Now they're always at my fingertips. I'm not sure I like how the markers stick out from the rest...didn't think about it until I set it up. (I may send an update once I've actually had a chance to use my new space so I can tell you honestly if I should have chosen just the ink/refill combo.) But I'm so excited about these great quality products that I've shared pictures with my Stampin' Up! friends already! I love that it's the perfect depth to fit into the back of my desk while leaving plenty of work area up front. I had room to place the large lockdown punch holder right beside the combo holder. AWESOME! Every Stampin' Up! demonstrator needs one! Love the all-purpose storage to keep ink, markers and pad all organized! The customer service and follow up with shipping notices is excellent. This is amazing. I can get rid of 5 holders to put this stuff in one place. Oh my goodness, what a marvelous find! I love this product. I have everything right at my fingertips. I ordered the lock down punch holder also, and it sits on top of my combo ink holder. I never have to search for anything, everything is right there. I never knew how long it took me to find everything I needed to start a project. Now I can just look to my left and everything is right there. It makes Scrapbooking so much easier and more fun. Your products are so beautifully made and so essential for my crafting. Thanks for helping me get organized so I can enjoy my hobby. We are downsizing to move into a retirement complex. You are making it so I can continue what I love to do in a much smaller environment. Thank you for the organization, beauty and functionality of your products. I'm in love. After dealing with a not-so-usuable craft room, this product (and the other products from Stamp-n-Storage, have made me productive again and I so enjoy that space now!! I was very impressed at how good your packing boxes were to ship the product. I am so excited has I and getting my stampin room done.I am staining the holder to match my cabinets. The holder fits perfectly my stamp pads. I just got this yesterday and have completed putting my product away. It really cleared out two drawers. I wish it had come in white to match my table and I thought the wood would have a nicer finish. But It's definitely a great product. I recently purchased Stamp-n-Storage products. The shipping was super fast, and everything has been very well made. LOVE THEM! They are beautiful and have simplified my stamping process, making stamping even more fun. I smile every time I look at my reorganized stamping space! Love my Combo Holder! I was able to get rid of a wooden pad holder and 10 plastic stamping cases that held my refills and markers on my counter. This truly is a space saver and everything is readily accessible. I also purchased the Lock Down Punch Holder, Wafer Die Storage, Magnet Cards, and Embossing Folder Storage. All of these saved me a lots of space in my room . 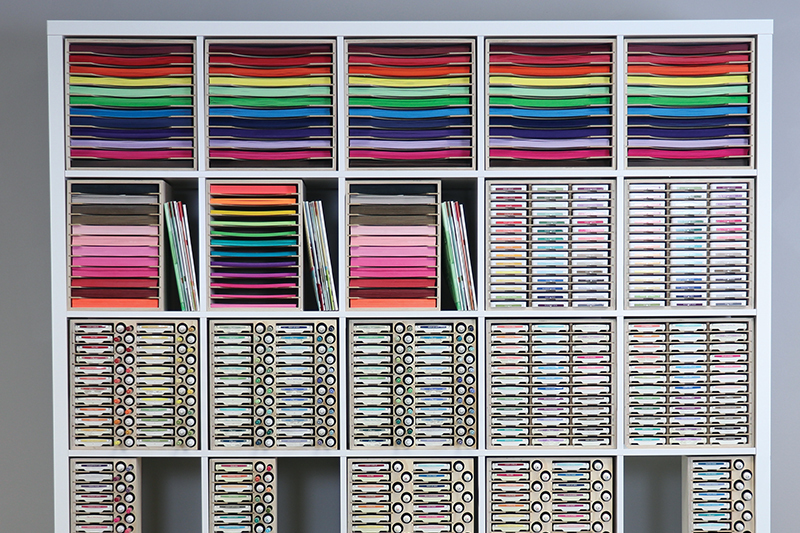 Next on my list - organize my paper storage. I love this storage unit. Pads, inks and markers are at my fingertips. Very easy to install and very sturdy. I absolutely LOVE my combo holder! I was using a "spinner" holder before, which worked well for a while. Then I reorganized my supplies and decided to take the plunge on the combo holder -- WOW! I love that I have all of my colors right in front of me, with no more digging for the right reinker. And the holder actually gives me more work room on my desk -- who doesn't want that?!? I highly recommend this product. I purchased the combo holder to help organize my craft room. It arrived safely and quickly. I will be purchasing more products soon, to complete my storage. I have all my ink pads, refills and markers all in one place. No more looking all over to find the marker to match the pad. Looks great and was delivered really fast too. I have been a stamp-n-storage customer almost from their genesis. I personally have 3 combo holders; 4 punch holders; a washi tape holder; and a copic marker holder. Most recent purchase is for the craft guild room that I belong to--as always, product is superb and shipping was much faster than anticipated! I am loving the organization this gives me! Having everything at my fingertips is wonderful and will make me use them more often! Best holders for markers, pads and ink refills. These are the best made, best thought out with the crafter in mind, ink plus holders on the market today. I already own the Super ink holder but needed another for more inks I have accumulated. Thanks for being consistent in the building of your product. I can always count on the amazing accuracy of construction that it will fit & match the other products I have bought from you in the past. Organization is the key to a happy paper crafter. It is so important to minimize the time looking for items so that you can spend more time creating and having fun. The Stamp-n-Storage unit looks great in my craft room, I am so pleased to add this unit to my room and show it to my friends. Pads, markers, and refills all at your fingertips. Love it. I absolutely love this holder. It keeps all the ink products together in one place so I don't have to go searching when I need something. This is the second one purchased, since I have so many colors, plus leaves room for more. I purchased the large combo holder with the kick stands. I was concerned about how it would arrive since it had to ship to California. It arrived in perfect shape, quickly! We are so happy and organized now. Can't wait until our next purchase. This combo holder is fantastic ! Great craftsmanship and it is light weight, but built to last. Thank you! Highly recommended ! Helps me find my ink pads, re-inkers and markers in a snap. Having the ink pads, the refills and markers all together in one compact storage piece is perfect. The 60 Combo Holder is fantastic!! I feel much more organized now that I have two of them!! Hightly recommend it!! I LOVE this combo holder. It's a genius organizational tool and space saver. I can't say enough good things about this product. I absolutely love it and are so happy to be able to store my ink pads, ink refill bottles and markers. GREAT PRODUCT. Received my Combo Storage Units yesterday and they are full. Love having all my ink pads, re-inkers and markers in color order. I can't wait to add to my storage collection to complete organizing my stamping supplies. Having all related colors (Ink pad, refill, and pen) together and at your finger tips; hooray! Great idea beautifully executed. Always happy with my purchases !! I love organization and these custom made products are my favorite...everything matches and I can add one piece at a time being sure they will fit together perfectly !! I am so happy with your products !! I love that you can paint them to your liking and that they keep all your pads, reinkers and markers together. This stamp storage is wonderful. It is not deep and holds everything... Pens, stamps, and refills. Don't know how I lived without it. 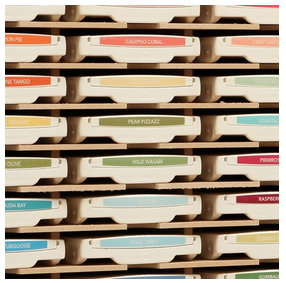 This has to be one of the best products Stamp-n-Storage has designed! I had so many ink pads, markers and refills that it was not easy to see what I had and what needed to be replaced. This solves that problem while providing me a way of seeing all my color families at the same time as I design. Love it....and well worth the price....same sturdy construction and attention to detail as I have found in the many other products I have purchased from them. I have struggled for years keeping the ink pads, refills and pens all in separate places and always trying to find exactly the correct refill or pen. You have made my life so much easier. I loved the 60 storage so much that I ordered another one. I can finally have everything together. I ordered several items for my craft room which my husband was remodeling for me. They products are great I am very Happy with my selection of product. I am going to actually have to place another order in the near future for several add on. Thank you Stamp n storage. LOVE the combo holder. Love that it takes up such little space on my counter. Didn't realize the markers were going to stick out so far, but I'm getting used to that. Painted and sure looks pretty! Great for an easy reach! Deliver on time! Fits perfectly on my craft desk & is a time saver. The Ink Pad Combo Holder is amazing! Now I have all my inks, markers and refills in one place. I feel so organized and I'm sure that I will be more productive as I work on my creative projects. No more searching for the pen or refill that goes with my ink pad. Thank you Stamp-n-Storage! 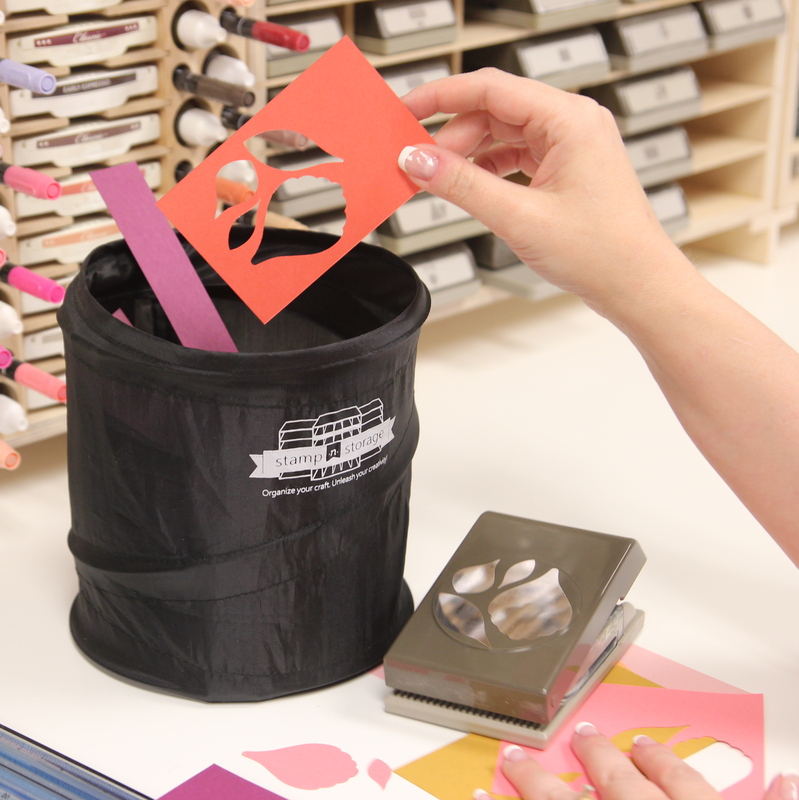 I am a Stampin' Up Demonstrator and I absolutely love the Combo Holder for ink pads, reinkers and markers. Everything is right at my fingertips and it's so convenient. Definitely quality craftsmanship. Definitely a must have. No regrets here. Brings all the elements into a concise, easy to use space. I don't know why I waited so long to buy the Combo Holder. It fits nicely on my desk, and holds all of my ink pads, markers and ink refills. Greast quality and attractive storage unit! I absolutely LOVE having everything in one place at my fingertips! I love my combo holder. It is very well made and looks so nice in our studio. Took advantage of the sale and got a great deal! I highly recommend this product. I absolutely love the Combo Holder for my craft area! Not only can I store my inks, pads, and reinkers...I store my distress sprays, distress stains, and Colour Bursts on time where I can see them! Everything all in one place. Organized. Neat and tidy work space. Love it! So excited! It fits perfectly on my IKEA desk and I love having all my stamp pads/refills/pens in view at all times! That's really all I can say about Stamp-n-Storage products. I have two of the Combo Holders. Filled to the brim. Just got my mini ink pad holder. That's filled also. The quality of products are beyond anything I expected. I know we will be friends for a long time. A friend had the combo holder and at first glance I knew that was exactly the one for me. I ordered it and it arrived as stated. Everything was included for hanging and I do mean everything...no need to purchase screws etc. I also enjoyed the DVD included with this combo holder! Thank you for such a lovely product!! Love this. Quality construction, fast shipping and beautiful!! Wish I had more space and would buy more. Thank you for creating these wonderful storage pieces!! gREAT FOR ORGANIZING ALL YOUR This is a great item to organize all your Stamp Pads, Markers & Reinkers. This is the 2nd one I have purchased from Stamp-n-Storage. I purchased another one from another company & I'm replacing it with this one. The Stamp-n-Storage one is a much better quality! Very well made, thank you for your wonderful craftsmanship! It is great to have ink pads, refills, and ink pens all together at a glance. The perfect holder for stamp pads, re-inkers and pens! This is absolutely the BEST ink storage on the market. I cannot believe I waited as long as I did to purchase it! 5 STARS ... the best! Everything fit perfectly. It is so easy to see the colors and grab the marker that matches. My friend had purchased a Stamp-N-Storage Combo Holder and when I saw her's I just had to go my own! I absolutely love it. It fits perfectly and exactly on my shelf in my stamping room! Love it! All neat and organized! The one I got is for my Ikea shelf. I love it. It keeps most of my stamp inks in one place along with my pens and ink, next to the same color. Looks organized and neat. What a classy way to display my stamp pads, refills and pens for easy use! Love it! I am so glad I bought this. I kept putting it off. Too expensive I thought. BUT it is worth every penny. I love it! Love my Combo Holder. Great to have stamp pads, ink refill, and markers at my fingertips. So convenient! I love this storage product. My stampin up ink pads are all in order and right at my finger tips. Because of my limited income I'm having to purchase my supplies a little at the time. I had already purchased the large combo holder and added this one to complete mu storage. I have never seen such well-designed products as that of stamp n storage has designed. Thank you stamp n storage. I love this combo ink pad holder! I love my Combo Holder. The quality is excellent. All my inks are organized and in one place, right at my fingertips. Now I want to try the paper punch organizer. My craft to already looks so much better. The quality of this product is outstanding! It is very sturdy (even the individual separators between ink pads). It is a must have. I love the way my ink pads and markers are right at my fingertips! Love It! Beautifully made, and is exactly what I thought it would be. So happy with this purchase! I'ts a great product, I'm happy to have my ink pads stored in a way that I can find what I want . Organized and all in one Place! Love the 60 combo holder, hope to order another next month! Absolutely love this ink storage system! It doesn't take up much room and everything is so neat & organized. Five stars! Love my new combo holder. Everything fits nicely and I can easily see what I have and what I don't have. Plus, my ink pads are now off my counter! I love these storage items. The beautiful craftsmanship of every product I have ordered. Made in the U.S.A. makes it even better. Please support this great company you won't sorry. I am very happy to receive my Combo Ink Pad Holder. This will save me so much time not having to find the ink that matches the pad. Thank you stamp-n-storage for your great products. I was quite surprise at how sloppy the workmanship is on this piece. I bought two of these and they are wonderful. I love having my ink pad, pens and ink at my fingertips. Quality is great and so is this company. I want to thank you for your attention to details in producing this line of storage solutions for stampers. I have received the combo and will be ordering several more components in the near future. I could not be more pleased with the quality and service. I have been crafting for about sixteen years, and just recently bought a new home. I now have a full craft room. Wow what a blessing it is and my combo holder with the desk top stickles organizer is so so fantastic!!!!! I will be getting the organizer for the copic markers as well. Now I understand why I had to wait and these products were back ordered. The quality is wonderful and well worth the wait. I also purchased the kickstands. With the kickstands my daubers fit in their case right underneath. Thank you for the DVD what a wonderful way to share the Good News! I received my unit and set it up. I love having my ink pads and refills together. I only wish I had known that the markers would be too long to really match the pads and refills in length I don't like how they extend beyond the refills. I will continue to store my markers in the thin stamp boxes by families. Otherwise I love the unit. Just wish I had ordered the pad and refill unit. It might be helpful for people to be reminder of the depth and the length of the markers. There is a 2.5" difference. I was so excited to receive this storage piece! It is extremely well made and I am looking forward to getting it finished and using it often! It is a very welcome addition to my craft space! Thank you for the quality workmanship that goes into your products and the prompt shipping! I bought the punch holder earlier and just purchased the ink pad/ink refill/marker holder. I'm thrilled with my two products from Stamping Storage. They are well built & a great storage ideas. I love my two stamping storage & will be buying more! The combo holder doesn't take up much room and works perfectly to store Stampin' Up! ink pads, refills and markers!! I love it! 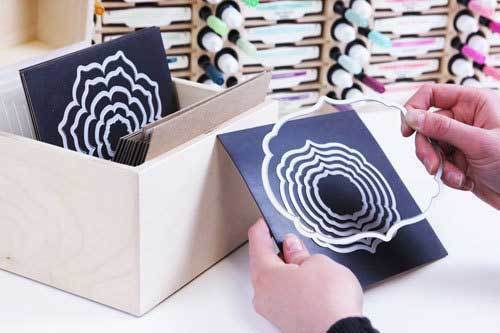 I've tried several other ink pad storage pieces and this blows them all out of the water! High quality. Perfect fit. And I can make it what ever color I want! Absolutely perfect! Great way to store inkpads, trinkets snd pens. Perfect fit for Stampinup inkpads. I love it!! So well made it is so functional but also beautiful! I am pleased with the product. I did full in the nail holes on the sides.I did have to fill in two small nicks in the wood. I primed ,painted ,and sealed it.I'm sure it will make my crafting much easier. Everything is all together. This product is very well made I got big and small ink pads in the spots. It has holes for ink pens and another hole which I had hoped my inking tool would fit but it's a little too short. I'm sure I will find something to fit in it. It has organized my ink pads and I needed that. I would recommend thus product. The combo holder is very solidly put together and easy to move around if needed. I love having my ink pads, markers, and refills all together and displayed right in front of me. This is awesome because now I can have all 3 products together and I don't have to search for the refill or the marker. The most organized storage with the least possible amount of space. Well built, love it. I intended to paint this white, but it looks so good as is, I won't bother. Arrived in perfect condition. I am not going to paint it at this time. Yes, there are some rougher holes for inks. This shelf has helped me to work on one of my themes this year---ORGANIZATION. Boy what a great way to store your ink pads, reinkers, and pens. I need one more (smaller) to fill up my sheaf. Still smiling - Love it! I have been smiling ever since I opened the box! I love these products! Now I am able to keep products together which gives me more work space, freedom from clutter, and more storage space for other products. The cost was more than reasonable! Pads, markers, and re-inkers are at your fingertips with this organizer. Colors are easy to see. The shelf is sturdy. I am happy with my purchase. I bought the 60 ink pad, combo holder and from the pictures believed that it would not have any rough wooden edges. I was surprised to find that the holes for the ink refills are very rough around the edges and needed sanding so I would not get slivers when using. Other than that, it's fine. Will need to paint for sure. The box the unit arrived was untapped at the bottom. The holes for the refills and markers are very rough. No sanding done. Ordered 12/12, received 1/5. Missed being under the Christmas tree. I love how organize it makes me be!! Worth the money! Seriously just bite the bullet and get it if you're even 'just' thinking about buying one. I'm in love with it and have already ordered more products! I recommend getting the kickstands too if you are placing this on a table. I had stamp pads in one are, refills in another and the markers in another area, this organizes all the products together, it is a great tool!!! Combo Holder best ever Christmas Present. I was just so excited to recieve the Combo Holder as a Christmas Present. Once I filled it up I realized just how wonderful it is to see al of your stamps pad, markers and re-inkers in one place. It make seeing what I have, if I need to order an item plus just so very easy to grab what I need when creating. I spend way too much time trying to find what I need when creating a card or scrapbook page. If you are on the fence about buying this item believe me you will love it and wished you had ordered sooner. Love, Love, Love this item. Great product and easy to keep my stamp pads organized. This came ready to fill up-- I thought I would have to assemble it.! It is so easy to find the right color stamp pad and matching marker or refill now. Thank you! I am glad to know that you are Christians! That was a bonus!!! Just received my Combo holder. In addition to great design and organization, it is so well made! Love that everything will be right within reac. I just received my Combo stamp pad/refill and marker holder and I love it so much that I ordered the matching punch holder!!! Great craftsmanship!! This is my 3rd one. I love having everything at my finger tips. I really like this product! It's so easy to find my like-colored inks and refills/markers. I feel so much more organized. I love that it comes unpainted as I can use whatever color I want. I give it a 4 star as it is ideally perfect for ink pads, markers or pens and refill liquid. Only problems is my pads I am using (stamps of life ink pads) dont fit in it like the picture shown. I have to put it the other way and its alittle hard to get it out. My pads are alittle to big to fit. :( I am using it and like the idea I can see all my pads. I just had to fix it to where it will work. I was very impressed with the Combo stamp pad/marker holder. It fits Stamping Up stamp pads very well. It was shipped quickly and in good shape. Owners are very friendly and respond to emails quickly. I love, love, love this stamp pad organizer. It's very heavy and well made. Roomy for pads and love that markers and ink refills are all together wit pads. It will make keeping up with everything so much easier. A awesome product that is worth every penny!! This Combo Holder is more than I thought! It has made my craft life so much easier, because I can see what I have, and is handy! It fits on my craft space , but does not take up too much space. I am very happy with this well constructed product and with Stamp-n-Storage customer service! Thank you! I love the Combo Holder! It is very well built and I love seeing right away if I am missing an ink refill or marker. The Combo Holder is a great organizational tool to store your inks, markers and ink refills. Everything is right at your fingertips so you are always ready to create. I am 100% pleased with my Combo Holder. I bought the 60 combo holder and it is absolutely perfect! It is so handy to have the inkpads, markers and refills displayed all together...saves so much time! My expectations have been fully met. It is so awesome having my craft supplies out in view and organized. I received this combo holder and immediately filled it up with my Stampin Up ink pads, refills and markers. This is the top of the line organizer for me. Thank you so much! I am very happy with my combo holder. It looks great, frees up space and lets me see my ink pads, refills and markers at a glance. I would recommend it . I love my new combo storage units. All my inks refills and pads fit together on my desk. Just waiting to have time to add my markers. Can't wait to order more storage pieces. I love my new unit! Now I'm waiting for my markers to arrive and it will be complete. This is such a great addition to what I already have. I'm very pleased with this Unit. I can't wait to make room for more of your storage holders. Arrived yesterday, couldn't wait to get the markers, inks and refills into it! It's already made for better organization for my entire carding area with the extra spaces I have because of it! I love to have my ink pads, ink refill and markers together. Now I know what refills and pens to order. This is the second one I ordered and I love this storage piece!! Keeps all my stamp pads, ink refills and pens in an order to my liking!! I will probably order another one soon!!! LOVE my new combo holder! This is great! I love how the pads, reinkers, & markers are all together next to their matching color! Makes life so much easier! Love this holder! Love having all my pads, refills and markers in one area. It also helps to see all colors at a glance. This is a great to have all three items in the same place. It save space for me in my scrap room. Its fits great in the space that I have. Glad I bought this. Workmanship is great very sturdy. I love this thing! It came out of the box ready to go - fully assembled. My husband - who builds things - was really impressed, and that's not easy to do. I put it right in front of my work area and the ease of seeing and reaching all my inks/refills/markers is wonderful!! Love it. Just what I needed. Having the items together helps me avoid buying duplicate items. Rather pricy but should last a lifetime. This was exactly what I was looking for. Makes finding my stamp pads and colors so much easier than the revolving type of storage. This is my 3rd combo ink holder and my ninth StampnStorage product, purchased in the last 6 years. Quality and service remain excellent all this time. Will shop more in the future. I bought my first combo several years ago. I was a bit disappointed that my new one doesn't exactly match the old one. It is about 1/2 " longer and it hangs opposite of the old one. This product is the bomb....I'm getting my craft room "The Nest" organized and will be sending pictures soon. Received my Combo Holder yesterday, now to get it all together. Love all the storage ideas you have. I love this combo holder. Finally, my stamps, markers and ink refills are within hands reach and I don't have to search for a specific color. This was the best investment I've made in a long time! This would have been 5 stars if it had been laminated in white or had a more finished appearance. Ii love the combo holder. It is so nice having pads, refills and markers all together and at your fingertips. My craft space was a disaster and VERY frustrating. This holder is getting me excited about stamping. This would be a five star review if there was a bit more care taken in the bottom refill holes. They seems to have holes in the bottom of them like maybe they ran out of room when it was crafted. It doesn't really effect anything for me but it is a lack In craftsmanship. Otherwise the product works great and I'm really happy with it. Thank You so much for offering this. I love my having my stamps and markers right there. I had them strung all over SB room. The only thing I don't like its the unfinshed surface. Very well made all the openings are sanded. Will purchase again!!! I love how this fits on my crafting counter. I can see colors, refills and markers at a glance. Great addition to my room. I love the ink pad, marker, refill combo holder! It is genius! It is so well made and looks so good in my craft room. I love seeing all my inks on display and not having to turn a carousel to find the color I want. I wish I had bought this a long time ago! Fabulous product for getting the inks, pens and refillers neatly stored in one convenient to reach place in my very limited craft room space. I love my combo holder, finally all my re-inkers, stamp pads and pens are all together in my craft room and not in boxes. Received my Combo Holder and I am extremely pleased. Everything organized and at my fingertips plus it gives me extra room on my craft table. I highly recommend this product. My friend Linda Cruz from Round Rock, Texas ordered a combo holder and punch storage and she suggested your site to me. I am so glad she did because I am thrilled with my combo holder. I also am happy that it was made by Christians. Do not have my studio set up yet but I am sure it will be a five star. If you collect Stampin up inks you must have the combo holder! I received the Combo Holder as a birthday gift and couldn't be happier! It fits on my desk and I love being able to look up and choose my colors without having to turn a carousel! Everything I'd displayed right in front of me. The holder is very sturdy and well constructed. Now on to the paper storage!! Love the produce, very offended by inclusion of religious material in packaging. Can't wait to order more!!! I LOVE these products! Solid! They are made of real wood not particle board, they are made to last forever just like your crafting! Everything fits perfectly and they help not just with organizing but saves space. Will definitely order more! I just loaded it and found out that many unloads need to store with the short side facing towards you. It needs to be a bit wider if you want to look at the wide /long side of the stamp. Love the re-inker space. However, there is not enough room to store square re-inkers as stain metallic brand unless you leave the stamp and re-inker in the original box. 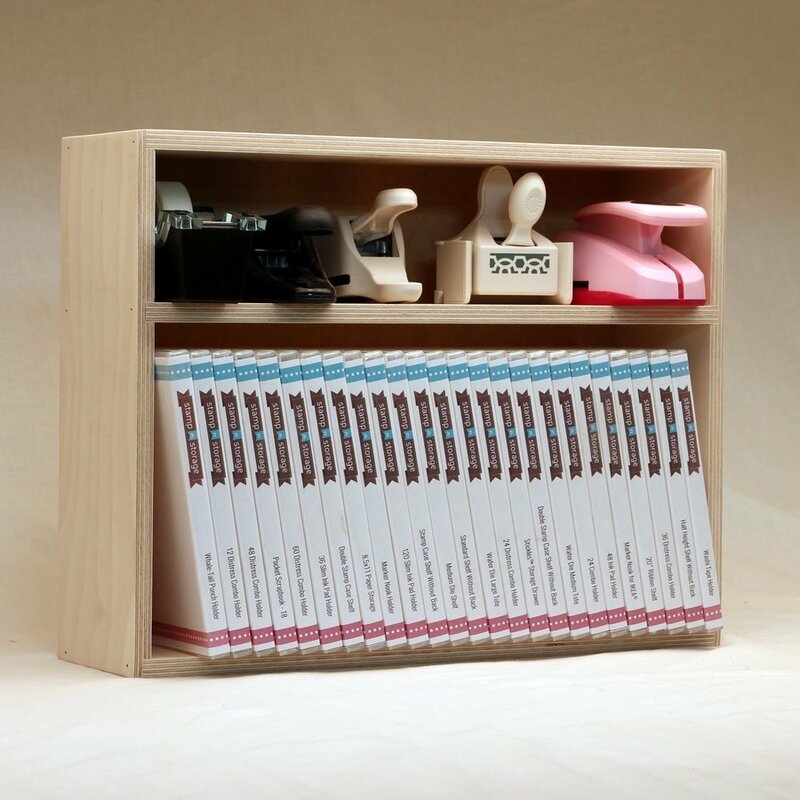 Solid construction, tabbed pull out shelves which makes it easy to reach stamp pads. I can actually see and use what I have. Great option, wish price was better. I'd order more, but can't afford it at the current price point. Wish I would've gotten the larger one! Recently I purchased the 24 ink pad combo holder because my 48 was full...filled the new on up also! I just love keeping my ink pads, ink refills and markers together! Love being organized! Thanks Stamp n Storage! Being tight on craft room real estate, this product is simply amazing for organizing ink pads, refills & markers in the least amount of space as possible. You won't be disappointed. I LOVE mine! Everything is together in one place. I pained mine to match my craft room counter and it looks built in. Now I need one more! The new SU colors are out and after 16 years I have a LOT! It is truly ideal! The combo holder helps to keep everything organized and my stamp pads and other product also. I recently decided to add Stampin Up markers to my ink options and I like the way the pads and markers can be next to each other. I also like the fact that the unit matches the punch holder that I purchased as well. What a difference this makes for easy access! Very nice. Customer service is awesome. So nice to have ink all in order. When is you next sale? Ink storage! I love it! I love new ink storage unit! It is not deep, so fits great on my desk! It is a very sturdy unot! I am very pleased with my Stamp N Storage Combo!!!!!!!!!!!!!!! I love that I no longer have to go to 3 different places to find my pads, markers and refills!!!!! SO VERY WORTH THE MONEY!!!!! Organization keeps the joy in card making!!!!!!! I am so glad that I finally made this purchase. There is nothing better than perfectly made storage spots for my stamping items. I needed another and so happy to have the Combo holder ex large and small. Quality product. Love the combo ink pad, re-inker and marker holder!!! This is perfect for my stamp room. I am so excited to have everything at my fingertips!!! I am also very impressed with the magnetic cards. They are really strong and hold the thinlits very well. I have 3 of the combo holders, for my ink pads, markers and ink refills. I love them they keep my ink easy access and organized. Very sturdy product, would recommend these to everyone. This product is great. It does not take a lot of space, it holds everything in one place. I do not have to look through all my ink and pens to see if there is a match. It is a one stop supply storage spot. It also keeps everything neat and orgamized. This is the perfect storage unit for my pads, refills and markers. It took away two places of storage and condensed it on one! Best item I have so far. Planning new design for my craft room. Looking at more storage units of yours. I love the space for ink pad, ink refill and coordinating marker....genius. I've got to admit I was watching for the UPS truck to arrive so I could fill my new combo holder. I was not disappointed one bit. I see myself ordering others in the future as I love inks! The combo holder for ink pads, re-inkers an markers is just what I needed to keep all my colors in one place with easy access. Everything looks so neat! I can't brag enough about my Stamp "n" Storage Combo holder. Stores pads, markers and refills in one easy location. I have two so I have room to grow when Stampin Up comes out with new colors. Wow! Wow! Wow! Happy Happy Happy!!! I saved for it and then much to my surprise a coupon was offered IN my email. While I waited, I got my space ready. It is wonderful! Looks great, holds all my pads, refills and markers. Easy to reach, looks great! Win win! I purchased the 60 Combo Holder for room to grow. LOVE having all my ink pads, markers and inkers right in front of me. Takes up less space and no more spinning the carousel around and around ! I love the combo holder. The best investment I made. Thank you!!! Before I downsized into my current stamping studio, I had the 60 Combo Holder and every ink pad, marker and re-inker. Today, I focus on my actual color loves and only needed space for 36 ink pads, markers and re-inkers. This 36 Combo Holder is "just right." I purchased the combo ink pad holder that hold 60 inks, markers, and reinkers over a year ago and love, love, love it. I just recently purchased the one that holds 24 as my collection has grown. I have also purchased the storage for the now cancelled Stampin Up Blendabilities. Luckily, I had them all before they stopped making them and that storage/holder is great. All great products, quality, and customer service. Very happy with all my purchases. This holder has freed up so much space on my desk and I just love that everything is in one place. It's a quality made item and a great product! I just love it! The combo holder for ink pad, marker and re-inker is the perfect visual holder for items that I use all the time. I don't have to search through drawers to see what I have or need....it is right at eye level. I also ordered the Marker Nook to be used for products used all the time (dots, tape, adhesive, etc.) and it fits beautifully between the Ink holder and the punch holder. Stamp-n-Storage products are well made and attractive too! My first piece was a ink pad unit only that I bought as a dent and scratch. Loved it so much that I had to save to buy the one that held the markers and re inkers. I have so much fun, just organizing them. Then I received the catalog with 15% off, and of course I had to order another storage unit for my distress pads and re inkers and markers. And it didn't stop there. They extended the sale so I thought ... Why not. I should get the units for my whale tail punches and also for my lock-down punches. Now to start saving for the other pieces that I would love to have. Can't wait!! Thank you Stamp and Storage for having great products!! Love 'em! My husband hung it for me and I just got it loaded up with ink pads, refills and markers. Perfect! I ordered the desk/shelf model in error, but my husband was able to hang it on the wall for me with a small amount of effort. If you want the wall mount model, make sure you pick it as the desk/shelf model does not come with any hanging blocks or hardware. I bought two of these holders to replace a more cheaply made solution I was previously using. I LOVE how this keeps everything all together, right at my fingertips. Creativity strikes when it strikes and I no longer lose the spark while hunting down the matching marker or re-inker for that great idea I just got...! I purchased the smaller combo holder to supplement the larger one I already own....could NOT function without them! Love all of the products I have purchased from Stamp-n-Storage! All of the products that I have ordered from Stamp n Storage have been of the highest quality and the service is excellent. I am very happy with the Combo Holder, the Lock Down Punch Holder and the Whale Tail Holder Package, the Die Shelf, the Wafer Die Storage with magnet cards, and the marker holders. I would recommend this company to anyone interested in creating an organized craft area. WOW, I just love my ink pad, marker and refill cabinet. It is so wonderful to have all 3 items together. Everything fits just perfect. Now I need a bigger room so that I can buy all your other wonderful products! I will be ordering again soon and referring your company to all my friends! Price very reasonable and shipping quick. Love it, Love it! Everything is grouped together so you can see what you have or what you need and I always need something! I am very pleased with both my Combo Holder & Marker Nook. They r very well built but I thought they were going to be painted white. I guest it will give me the chance to paint them the color I choice for my new craft room in the future. The only thing I was dissatisfied with opening my package was finding religious propaganda in with my order. I am a spiritual person but I think your company is crossing boundaries with your purchasing customers with religious propaganda. Couldn't believe the outstanding quality! Excellent construction, hold all my inks, re inkers, and markers as advertised. It is a great addition to my craft room! I love having all my ink pads, refills and markers in one place and all visable. It is truly worth every penny! I can't believe how much space these two 48 combo units actually freed up in my stamping room. Well made, well packaged and delivered promptly - what more could you ask for? I just got the combo organizer and filled it up. I just love having ink pads, refills and markers all at my finger tips. No more digging through drawers for things. Best investment ever! This product came quickly and the craftmanship was wonderful. Every item is now in order and easy to see. Now my craft room is taking shape. The Magnet Cards has allowed me to see what I really have on hand. Thanks you for of your creations. The best thing ever. Saved me space. Just received my new ink holder, it is wonderful. Fits great on my desk top with everything right there easy to grab and put away. No more searching for the right color, pen or re-inker. Just love it !!! The ink storage unit is GREAT. Arrived very fast. I would have given a 5 star rating but the wood on one side has a chunk of the wood chipped out. It was not in the packing so I know it happened before it was shipped. Other than that one flaw I'm glad I finally bought this unit for myself. This is EXACTLY what I wanted! Thank you! I first brought my combo last year and realized I needed more space. This is my second combo purchase. It has aligned up next to my first one perfectly. I have shared this site with many of my friends who also stamp and scrap. I am so happy with my purchase, it was well worth the money. I can't wait to buy more pieces. I have more time to work on my crafts now that I'm not searching for my ink pads and markers. Thank you! This is EXACTLY what I wanted! The wrong item was sent. We called them and it was IMMEDIATELY replaced with the correct one. We were able to actually speak with a person who was not only helpful, but extremely friendly. Great product! Great service! I had 2 turntables that I used to hold my ink pads so I was really hesitant about spending money for a new holder. I am so glad I did! It fits perfectly in my work space and now I not only have my ink pads right at my fingertips, I also have my markers and reinkers. Money well spent! I've purchased other items from Stamp and Storage and the quality and workmanship on this item as well as the others is outstanding. I plan to purchase other items as I continue to organize my studio. I love their products!! I love, love, love this product so much! The quality is amazing and my craft space is so much more organized now. I can't speak highly enough of this product! I love the combo holder also the punch holder. Really cleans up the look of my craft room. I love my new combo holder. The inks are so accessible and easy to pull out of the shelf. Love the idea of the refills & markers along side. I'm absolutely thrilled with my purchase. It's well made and makes storing my ink pads and refills so neat and easy to find. Much better than the alternatives out there and reasonably priced. I looked in to having one made instead of purchasing but the cost was double. Thank you thank you! I had a very bulky ink pad holder that took up way to much space. Now all my pads, re-inkers and pens are all in that same place. I love it and may need to order another smaller one in th future. Very very happy!! Love, Love My Combo Holder! I was surprised to see how long it was when the UPS driver dropped it off, but once I put it in my craft room and loaded that baby up, it actually freed up work space on my counter. This is my second product from the company and I do see more in my future!! I absolutely LOVE this combo holder. It is so nice to have my stamp pads, ink refills & pens all together in one spot! No more looking in 3 different spots for everything. This is well made and everything fits perfectly. I am now organized in one place I have everything. This has been my 4th product that I have purchased and I have been so satisfied with each one. I love the way the combo holder has put the ink pads, markers, and refill all in one place! Less time searching which makes more time for stamping!!! I have waited for a few years to buy this product and thought I would find cheaper ways to store my pads, etc. I have spent far more time and money trying to find storage than it was worth. This product is by far the best storage I have purchased. I wish I would have purchased it sooner than later and saved my time/money on the other stuff! Good sturdy ink pad, marker and refill holder. Appears to have been made to order. Will have to sand a few edges in order to put a finish on it. Will certainly keep everything organized! I have wanted this for a while now. Hubby got it for me for Christmas. It is everything I thought it would be. Best way to organize you ink pads, markers and ink refills so you can access them easily!! Very well constructed and makes seeing what you have easily and easy to access and to store back. Nice Design, Good Customer Service, Some Quality issues. The design is very well done and I'm very happy you were able to ship it out so quickly. Unfortunately their are some quality issues. The nails in the top and sides are countersunk but visible and unsightly. One of the dividers are glued in place and can't be removed. And their is some minor breakout in the plywood where the marker/ink holder meets the top. Received my combo ink pad holder yesterday and really love it! All my re-inkers, markers and ink pads in one place for easy quick access! Great customer service comes with all products from Stamp-n-Storage, which is a BIG plus for me! Love, love, love all your products that I have purchased so far. I waited quite a while before ordering this product. Did I really need it? Would it solve my shortage problem? Would it fit in my craft room? Big yes to all. This is obviously a custom quality piece. One suggestion: when shipping, please use tape or something to hold ink pad holders in place. Half of them fell out. Also, you might want to put a sign that says THIS SIDE UP. Delivered upside down, which is why the ink holders fell out. I love my combo ink holders. The new ones are improved on the old ones. The shelfs on the new one pull out for easy painting. The old ones do not. Thanks for great products! I have my eye on paper holders next. Combo Holder - Love It! I was so anxious to get this Combo Holder and I know I am going to love it! Still trying to get my studio organized and this is such a great addition. I highly recommend it, especially if you have the Stampin' Up! inks, refills, and markers. Nice to have them all in one place. I have a wide variety of Stamp 'n Storage products and every piece is well made, sturdy, and coordinates so nicely. I recommend this company without reservation. I have been impressed with my new stamp holder from beginning to end. I received it promptly and it was very well packaged. The Combo Holder is VERY well made. I am proud to have it on my table. Will order again. I love this product this is my 2nd purchase of the combo holder if I cold have fit the bigger one where I needed it to go I would have but instead I had to go with 2 of the smaller ones (48) everything is in one place now I don't have to search for anything the matching marker the pad the ink refill lover it!!! Thank you so much for a great product!!! I got the combo holder. love it!!! my stamp room 2 months ago got flooded so I am remodling. will send you a picture as soon is I have it going again. all my ink is right handy for me in this holder. it is the best! It took awhile to receive my order but it was well worth the wait! The quality is wonderful. It will be a joy to have my pads and inks so readily available and handy!! I painted mine with spray paint to match my craft room- it was easy to do and dried quickly. The COMBO 60 is A++. My first concern for a remodel of my Stampin Up! "creativr building blocks" was higher density storage for my stamp sets, cardstock, designer papers, embossing folders, dies, framelits, embellishments and tools. Having a place for everything will enable efficient use of these elements, both in locating and easy clean up so I never have to enter clutter when I want to play. I addressed what wastes the most time finding: my original stamp pads, markers and re-inkers. My second concern was great storage for my new Blendabilities (TM). I wanted each color co-located, within color families, and a better than a plastic stack-able tray system for the Blendabilities(trays tumbled when I removed a color). I drew out my ideal system, then hunted to see if anything would be available on line. Not only did Stamp-n-Storage accommodate my Brights, Subtles, Regals and Neutrals (10 of each), but also had an expanded system for the ten special In Colors active each catalog year, but also held my specialty pads: Encore Gold, Encore Silver, Memento Black, Pigment White, Pigment Vanilla, and a few black StazOn stamping pads. I have doubles of some colors besides black -- cherry cobbler, night of navy, and grass green; they also fit. I am tickled to have found the Combo 60 and the Blendabilities Tower. They both exceeded my expectations when they arrived. All surfaces are perfectly smooth, and there are no rough edges anywhere. Indeed, I got the quality and design I paid for! Finally, I have my stamp pads, markers and refills all in one place! There are still several products I want and will order when finances allow. It's all at your finger tips and the plus is how beautifully it looks!!!! A wonderful product for ease of storage for ink pads, ink refills & markers. Very high quality with attention to detail in woodcrafting. Why did I wait so long to purchase! Just received my Combo Holder for 60 stamp pads, pens, and ink refills. It is a dream come true! Everything I need is so easy to access. Easy ordering, shipped quickly, a great birthday present from my husband. I now have 3 products from Stamp n Storage and they are all wonderful. You need to try these organizers. My sister just came over and saw my Combo Holder for the first time, and she was in awe! She thought, as I do, that it's a great way to have my tools organized and convenient to use. I'm delighted with this product, and I think that just about every other Stampin' Up! demonstrator or customer will be, too. I have several collections of different brands of inkpads/re-inkers and these are perfect for storing all of them and keeping them organized. For now I have decided to leave mine natural. Love the way they look! Highly recommend the combo holders! Excellent storage option for your markers and pads. It takes much less space than any other thing that is available. I loive that the marker can be right beside the same color ink pad. This is a great product! I was so pleased that it came assembled! I love it! It's so much easier to have it all together. I recommend this. I have ordered several products from stamp n storage and all of them are great. I love the combo holder, it is so nice to be able to have my stamp pads, pens and extra ink right in front of me...no more searching for what I need. I love the product but the screws were not included and said they were supposed to be in package. I have ordered 3 products in the past few months. I am extremely pleased with how well-made and useful they all are! Thanks for helping me organize my stamping area! Love the quality of these products. Shipping is done well on these too. Can't wait to paint them and start organizing! I love this combo holder. It has really helped me become more productive. I spray painted it white to match my other storage cubes. I will definitely purchase more Stamp n Storage products! My combo holder arrived a few days ago and I filled it immediately. It is so handy having everything in front of me . I can't imagine stamping without it. Just received my storage unit yesterday and can't wait to use it, decided to put a sealer on it before I used it so waiting for it to dry. I haven't been this excited about a purchase in a long time. My combo holder enables to see exactly what I have and don't have, in the way of ink, refills and pens. No more double-ordering because I don't have it all in one space. I LOVE this product!!! I just opened it this afternoon and immediately filled it! This storage unit is well worth the money. Everything is at my finger tips. Now I'm wondering why I waited to order!!! Love the holder. It is very well made and worth every penny. I will be looking to purchase other items as well in the near future. I love it. It was a great investment! I ordered 2 for the 60 storage combos after Christmas to organized my stamp pads markers and refills. They are awesome!!! It is so nice to have them all together and it doesn't take up as much space as I thought it would. I have just odered the 6x7 wafer die magnetic sheets and can't wait to get them. The folders they come in are nice, but I worry about bening the dies when I remove them from the sticky tape. Great products, great service-love, love love this company!!! I bought this thinking it would solve my storage problems and it does!!! !, My husband attached it to the wall and quickly filled it, I really like that you can put all the items for that colour together, I also put the T/H foam pad. When I am doing class, I just take it from the wall and move it to the table, so much easier than trying to keep all the things together. Great product, the postage to Australia was pretty good as well, thanks. This unit is so worth the expense! It is sturdy, carefully constructed to LAST, and holds the ink pads, pens, and reinkers all together. The thought that went into it - having the cut-out beneath the ink pad makes it so easy to pull out the pad with no difficulty! To have it come all assembled is another blessing - pull it out and you're ready to go (or paint/stain to meet your desires). Love it! Best quality and really keeps my stamps, markers, reinkers organized and easily reached! I love this combo holder. Just wish it had the mounting holes drilled when receive for ease of mounting on the wall. This is the BEST ink/marker/refill storage ever. The workmanship and materials are superb. All my inks are at my fingertips, and it's easy to see when one is missing. This is my favorite organizer in my whole room! I have all the markers, refills and markers in one spot. Super easy to categorize and find what I'm looking for! Thank you!! Why didn't I buy this sooner?!? I LOVE this product! Having my ink pads right in front of me as I stamp, PLUS having the matching marker and ink refill right beside the pad, is wonderful! 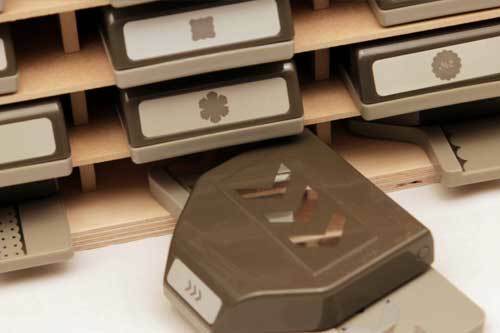 This product is the number one organizational solution that got me stamping regularly again. The only "catch" I noticed was that I have to be careful pulling my marker out of its cubby. The lid tends to catch on the lip of the wood and I lost one cap because of that. I still give this product five stars, though! Trying to find ink that is in a basket drove me crazy. After receiving two 24 ink holders sanity came back. Now it is so convenient to look up and see the colors and pick it out quickly. I stacked my two ink storage and also my copics. My craft room is growing and I can't wait to organize my papers next. . This is so much better than the carousel I used before! No more searching for three separate items. Because you can see all, reordering is simplified. Purchasing this is the best crafting thing I have done for myself in a long time. Not only does the product do everything it's suppose to do but the service from the company is excellent. I have the 60 combo holder. It is incredible! It looks nice and everything I need is within reach. Thanks so much! Quick and easy to keep coordinating colors together, can see at a glance what I have. Markers and ink pads are in optimal position to keep ink distributed properly. All my customers ask about this beautiful storage! I purchased this piece in 2013 and when it arrived I was so pleased with the value of the product and the beautiful craftsmanship! I could not have been more pleased!!! I just finished painting it white and I love it. Perfect tool for keeping my stampin' cave organized!! Storage made simple and Good Looking! I purchased my combo holder years ago and have been so impressed with the design, how it looks in my studio and the amazing functionality!! I also have other Stamp'n'Storage items and it has really made my studio SHINE! Everything dye based is in one place! So convenient, eliminates time wasted looking for matching colors to replenish the ink pad, and the markers are also easy to retrieve. I bought two of these - the top one holds my current colors from Stampin' Up! and my lower one holds retired/favorites. I love having everything in one place at my fingertips! I used to waste a lot of time trying to track down markers, refills and even my ink pads! Seems like they would end up all over the place even though I had not one but two of the Stampin' Up! inkpad holders. The marker would turn up missing, I wouldn't be sure if I had used up the refill or just couldn't find it, etc. until I finally broke down and bought the largest size combo holder. It's great... .easy to tell at a glance if I haven't put something away and takes very little time to properly stow items back where they belong after I use them. Has saved me a lot of time and stress searching for an item that I shoulda/coulda/woulda put away if I'd had a better organizing system. And you don't even want to know how many duplicate reinkers I discovered once I got my combo holder and put all my inky supplies away! While this is the only Stamp 'n Storg item I currently own, I am eyeing the punch storage unit now. The ink pad holder is very sturdy, well made and efficient...and I love that Stampin' Store offers free shipping on it. I highly recommend this product! I purchased this a while ago and am thrilled with it. All of mu SU inks, markers and refills are right in front of me when I stamp. This is the best product I have seen for storaging and organizing my Stampin Up ink, pads and markers. Everything is right where I know it should be and I can easily tell if I need a refill or marker. My husband is a woodworker and says he couldn't make it for this price and this kind of quality! I love this unit. I really like the fact that it fits almost all stamp pads and the re-inker bottles are right next to the pads. I don't have many matching markers, but as my collection grows - I have room for those, too. One of the best purchases I have made. I wall mounted mine and love that it's not on my work surface; but still reachable. I have purchased two of these and love them both. I have them on top of my desk where I can easily see which colors I want to use and which ones coordinate. The are very well made, sturdy and easy to pull out the ink pad or marker. I love this combo holder for my ink pads, markers and reinkers. I have it sitting right in front of me on my desk. It is so handy to be organized. My inks Re I'm alphabetical order so I can find it immediately and so know what is missing. I love this combo holder. I set mine up by stamping up color categories and love, love, love that my refill and matching pen are right next to the ink pads and I don't have to go find a matching pen somewhere else. Organization at its best! I like the product, but was expecting a little bit better craftsmanship. The holes could have been sanded down better, and spaced better too. One of the holes (for ink) was too close to another, and it made a new hole between the two. I also should have looked at the pictures/dimensions better, because I thought the marker spaces would have been deeper. Meaning, that less marker would hang outside. I love my ink pad, marker, refill storage unit! It is so solid and streamlined. No wasted space. I have the 60 pad one and it hugs up to the wall and leaves more space for me to work. Love the quality of workmanship and keeps all my inks etc. at my fingertips. Highly recommend!